I spotted this race some time ago but decided not to enter as it looked to be a bit of a faff - drive up the day before, stay in a hotel somewhere, drive to register at silly o'clock in the morning then get a bus to the start run then back to the finish. I have bad night vision so cant really drive in the dark unless I know the roads and was not sure if I would be finished in time to drive the 2 hours home afterwards. Last month I did the Millenium Way which was fairly close to home and also required a bus to the start. I really enjoyed that and the canal running (which I used to do a lot of) and the bus was not that bad after all. 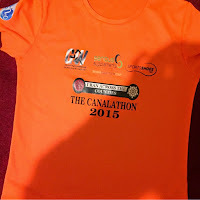 In addition my time from that race and the Railway ultra the previous week suggested I would be finished in time to drive home in daylight so canalathon was back on my radar. I dithered a bit and kept changing my mind between waiting out in case a place for Ashby 20 came up before finally entering on the closing day about a week before the event! Registration was at Sowerby Bridge leisure centre were we picked up our number, dibber (which we dibbed into a machine at each check point) T shirt (and medal if you had ordered one - I didn't as I have enough and didn't want to pay £6!). At 7.20 the double decker bus left for Manchester with the 50km and 75km runners. The 100km runners started from Sowerby Bridge ran to Manchester then back. 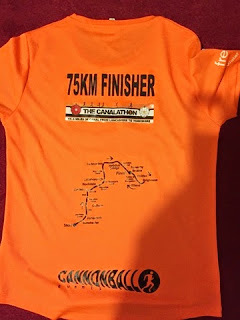 I would have liked to have done the 100km but there was no way I would be able to get home after and as the race was Sunday stopping over was not an option. I was treating it as a fairly steady training run. I did have a rest day on Saturday and had cut caffeine the week before so was taking it a bit more seriously than a training run but was not racing. If completed the course I would have done over 100 miles for the week and with 42 miles completed the previous weekend I was not exactly tapered! 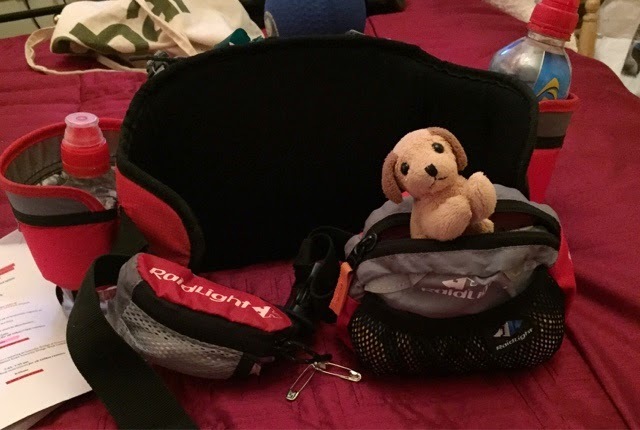 There was a compulsory kit list including waterproof trousers and spare top layer so I had to use my biggest raidlight waistpack which I just about crammed everything in including cuddly top (spot) who has become a bit of a mascot! 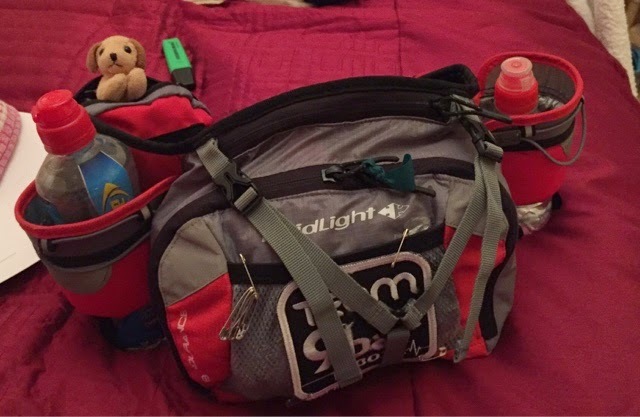 I don't like running with this as it feels so heavy but my other option was my Salomon rucksack which whilst a bit more comfortable it is harder to get the bottles out so I would probably not drink enough. 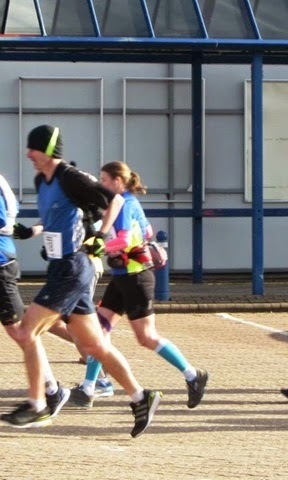 The start of the race involved running around a car park to spread the field out a bit before a few narrow bits!! The first few miles had some steps and bridges so pace was a bit slow but then I settled into just below 9mm which is about how my long training runs start. The canal path was nice and dry and there was a lot of tarmac but I somehow managed to fall over after about 5 miles. Another runner kindly stopped to make sure I was OK and we ran along together for a while. He was doing the 50km, it was his first ultra. I let him go as he was running a bit faster than I wanted to this early on. The route had been marked with spray paint so there had been no need to look at the instructions and most the time I could see the runner ahead. First check point was at 11 miles where the usual checkpoint items could be found - Jaffa cakes; bananas; coke; jelly babies; flapjack and some meaty things which I ignored as a veggie! I hadn't eaten up to this point and had only drunk half my 500ml bottle which was not good as I have found if I don't drink much early on I get really thirsty later. Luckily the checkpoints were closer together later in the race. I had a couple of cups of coke, some Jaffa cakes and a banana and was on my way. To the next checkpoint at 21 miles it was fairly uneventful. I did have a walk and a 9bar after about half way through this section even though I was not really hungry but I knew I had not had enough. It was in this section where I saw the 100km runners coming from the other direction which was nice. Same again at the next checkpoint. After a couple of miles I passed a lady, the first I had seen since the first few miles - the race attracted far more men the women as is often the case with ultras. Next checkpoint was at about 26 miles. I was a bit quicker here as I didn't fill my bottle knowing I had enough to get me to the 31 mile checkpoint. I did top up on coke and Jaffa cakes though. I was told here that I was 2nd lady although he was not sure if the lady ahead was doing the 50km or 75km. My pace had been gradually slowing and I had been finding it a bit of a slog but once I got past 27 miles I felt a lot better as it was now less than 20 to go! 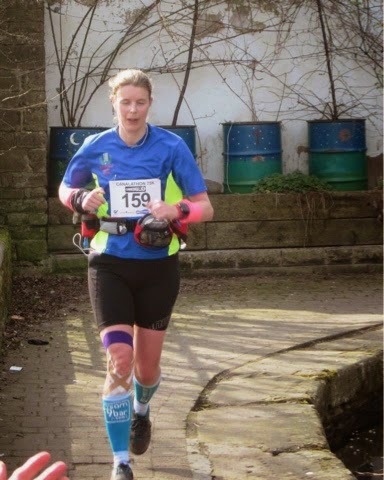 I was picking off a few of the 50km runners now as they were struggling at the end - for a lot this was their first ultra. At the 31 mile CP/finish of the 50km I was told that I was 1st lady in the 75km and that I was 4th overall which I was surprised by. Some people said that they would find it hard to run past the finish of the 50km to go on to do the 75km but it was not that bad although looking at my splits I did linger here a bit longer than at other checkpoints; perhaps because it was a bit hard to get going with all the finishers around and spectators waiting for friends to finish! The final section was an out and back along a different bit of canal with a checkpoint at the turnaround point. Until now I hadn't been too concerned about time. I had thought that I ought to be done in about 8 hours if I didn't get lost or if it wasn't boggy but was not really targeting a specific time I just wanted to enjoy the day. Time does obviously come into it at some point to help motivate yourself. So, as I got going again I worked out that even with a stop at the final check point as long as I kept under 10mm I would be done in under 7.30. I was easily hitting under 10mm so provided I didn't get tempted to walk too much or slow massively I would hit that without really having to push. As the route had been well marked at any turns or places where we left the canal I had put my instructions away. I had put the route on my garmin but had mapped that myself. It was only fairly rough so was not always the right side of the canal for example but at least I knew if I was roughly in the right direction. Quite often it had told me I was off course when I knew I wasn't but that was due to my plotting error. After a few miles there were two ways to go. As there was no marking I went straight ahead. After not too long my garmin was saying I was off course but I kept going a bit until I could tell from the bread crumb that I really was properly off course rather than it being a plotting inaccuracy. I got my instructions out - they told me I should have gone right so I had to retrace my steps. Shortly after this there was another more major issue. There was talk of a tunnel in the instructions and there were arrows to follow. The instructions didn't match the arrows eg it said to turn right after the bus stop but there was an arrow turning left before the bus stop. I thought that maybe the directions had been mixed up and those must have been for the way back so I decided to follow the arrows but then all of a sudden the arrows stopped before I was back on the canal. I guessed which way to go but it was wrong as I came to a dead end. I spent what felt like ages just going round in circles trying to get back on the canal in the right direction. I don't remember how it happened but I did finally get back on track! After this mishap I was really fed up. I assumed that whilst I had been lost I would have lost my position and knew that sub 7.30 was now out the window so I kind of gave up trying and stopped to have little walks when I didn't need to just because I was fed up! A mile or so before the turnaround I saw another runner who was the winner. He said he had been lost 3 times so I felt a bit better about my getting lost now! It seemed to take ages to get to the checkpoint and I was running out of fluids so when I did get there I was very pleased. I was told that I was in 2nd place overall!! How did that happen? I had moved from 4th to 2nd without passing anyone! That means others must have been even more lost than me! I stayed a bit longer at this checkpoint as I really had had enough and was also hot, hungry and thirsty; it was nice to have a chat with the chap at the aid station after being on my own so long. I expected to see other runners quite soon after turning back but it was over a mile before I saw the next runners. It was quite nice to then see others every so often for the first part of the return leg. By now I was having quite a few mini walk breaks to have a read of the instructions. All was going well until I got to the tunnel part again. I made a right dogs dinner of it. I followed the arrows thinking they might work going the other way but again they were OK to start with then once I went over the bridge they stopped and didn't tell me where to go. 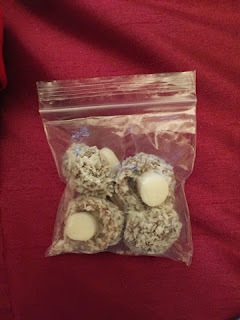 Now was the time to take on some coconut mushrooms as I thought the sugar hit might improve my mood! I am so bad with directions I couldn't remember where I had come from so struggled to retrace my steps. Bits looked familiar from the way out but I couldn't remember which was the right direction. After trying different ways and not bring convinced I saw the tunnel so instead of following the arrows I went with the instructions and got back on track again. From here it was all OK back to the finish but I knew there was a bit through town across a car park first so was paranoid about missing where to leave the canal and the instructions didn't say where to leave. There had been arrows when we did that bit earlier so I was just looking out for the arrows. As I had done extra distance I wasn't sure from the garmin where to expect these. The last bit seemed to go on forever and I kept thinking I had missed the turn off. Eventually I got to a place where a lady was standing with a dipper machine - this was the finish; we did not need to do the town and carpark bit! Finished in 7.44 for 48 miles so an extra mile and a bit. 1st lady and 2nd overall so was happy with that result especially given the getting lost which as well as adding on distance adds on time whilst you are standing there scratching your head trying to work out what is going on. This was a great race which I would defiantly recommend. Its ideal as a 1st ultra as there is no navigation required for the 50km and the 75km tunnel bit will be improved next year!